If you want to know about your ancestors today, you can send a little saliva to a company where - for a fee - they will analyze your DNA and tell you where you come from. For scientists trying to find out about ancient peoples, however, the challenge is more complex. Research published in the journal PLOS ONE by a team of archaeologists and microbiologists from Nevada's Desert Research Institute (DRI) and Southern Illinois University Carbondale (SIU) showcases the use of modern research methods to uncover clues about the genetic ancestry of Native Americans who inhabited the Desert Southwest during the last thousand years. "We were surprised by the consistency with which we were able to recover intact human DNA from a common type of plant-based artifact," explained co-principal investigator Duane Moser, Ph.D., an associate research professor of microbiology at DRI and director of DRI's Environmental Microbiology Laboratory. 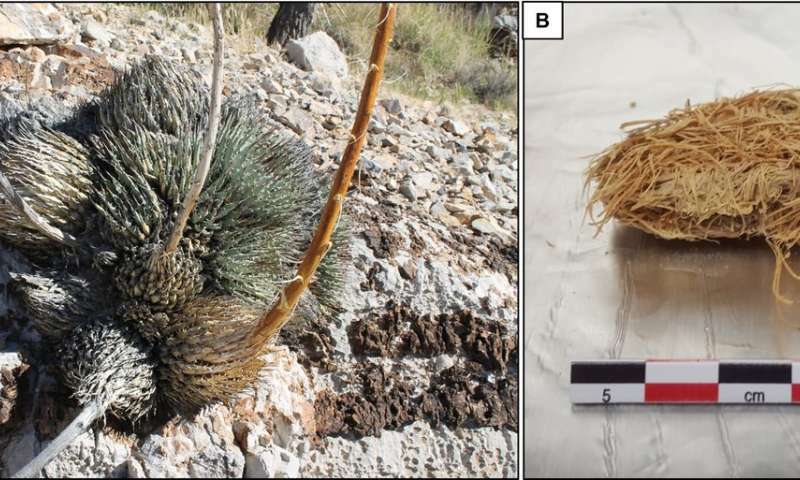 During the Late Holocene Epoch, which began 12,000 to 11,500 years ago and continues through the present, occupants of the Mule Spring Rockshelter in the foothills of the Spring Mountains of southern Nevada commonly gathered agave and yucca plants for food. The artichoke-like hearts and inner leaves of the plants were roasted then chewed to consume the sweet fleshy pulp. This left wads of stringy fibers called 'quids,' which spat out and left behind. In the late 1960s, researchers from DRI and the University of Nevada, Las Vegas (UNLV) led by Richard Brooks, recovered thousands of quids at the rockshelter. Put into storage for half a century without any consideration for DNA preservation, a DRI-led research team decided to re-examine the quid specimens as possible repositories for ancient DNA. "The quid's coarse texture is excellent for capturing skin cells from the mouth, making them the equivalent of the modern-day cheek swab," explained Susan Edwards, an associate research archaeologist at DRI and co-principal investigator who first thought of applying DNA extraction techniques to the quid samples. The research team used laboratory and computational resources at DRI's Southern Nevada Science Center in Las Vegas, and later at SIU, to identify changes in the mitochondrial DNA sequences that are maintained in ancestrally related populations called haplogroups. These haplogroups can then be compared to Native American tribes and other ancient DNA lineages. The study showed that the Mule Spring Rockshelter quid specimens ranged in age from about 350 to 980 years old. 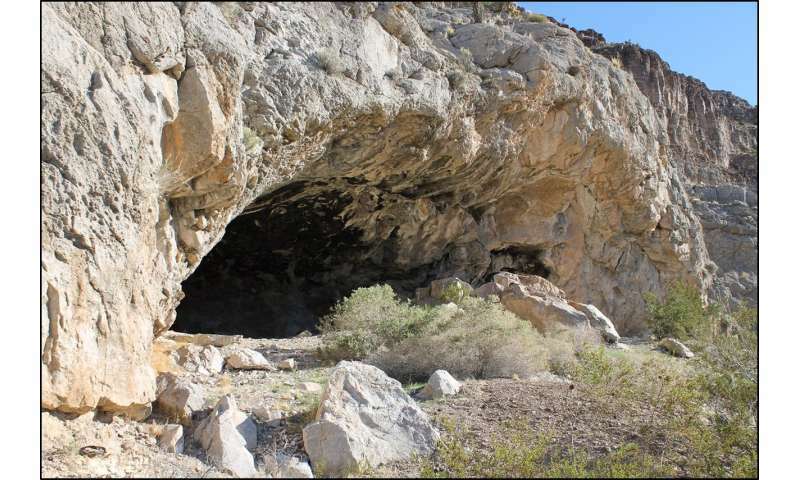 Because Mule Spring Rockshelter sits at a crossroads between the southern Great Basin, the Mojave Desert, and the Southwest Puebloan cultures, these results may provide a better timeline for an important but contentiously debated event in human history known as the Numic Spread. Today's Numic people contend they have always been here, a position some scientists readily support. However, some evidence suggests that Numic-speaking ancestors of contemporary native peoples spread from southern California throughout the Great Basin about 500 to 700 years ago; a date range which overlaps with the current study. Other studies suggest a much earlier arrival. This research marks only the second time that scientists have been able to sequence human DNA from plant-based artifacts, expanding upon an approach utilized by Steven LeBlanc of Harvard University. "Since these materials were also radiocarbon dated, in essence, they provide a time-resolved hotel registry for this unique site over a period of hundreds of years," added Moser. As an added benefit of utilizing DNA from quid samples (rather than from more traditional sources such as bones or teeth), the research team found that they were able to obtain the information they needed while being respectful of cultural sensitivities. "The distinct advantage of this genetic technique, is that it does not require the sampling of human remains," said Scott Hamilton-Brehm, lead author on the study and assistant professor of microbiology at SIU who completed his postdoctoral research at DRI. In the future, the team hopes to continue this work by targeting additional quids from the Mule Spring Rockshelter collection, with the possibility of corroborating evidence of older dates for habitation of the site suggested by prior studies of more traditional cultural artifacts. Plans are in the works to perform similar studies on quids from other Great Basin sites to glean additional information about the movements of ancient peoples and utilize more powerful analytical approaches to obtain greater DNA sequence coverage than was obtained by this pilot study. "We look forward to learning more about Native American presence in the Great Basin and Southwest area, and how the data compares over time," added Lidia Hristova, a graduate of the UNLV Anthropology Program who conducted much of the hands-on DNA extraction from the samples while working as an undergraduate research assistant at DRI and studying at UNLV.